This was a direct question from a friend, and my understanding is that an RV is a type of caravan - one can live in it. Her mother has said she will buy my friend an RV come January, and my friend, having been disappointed before, has asked if this will really happen. I'm having a bit of a problem as to which house to place the RV in - it can be driven, but my friend would be living in it. Note the almutens as follows: House 1 - Jupiter, House 2 - Saturn, House 3 - Venus, House 4 - Sun, House 5 - Moon & Venus, House 10 - Venus & Saturn. Will be back with some thoughts on this later, but if anyone knows where to place an RV, I'd much appreciate it. I'm thinking House 4 as it would be a primary residence, but....maybe not? Or is this as simple as the Moon - Venus trine indicating a gift (House 5. ruled by Venus) from Mum (Venus, House 10)? Moon is in the exaltation of Venus, North Node is on my friend's second house cusp, indicating a change of financial circumstances for the better. And Jupiter is at 7 Scorpio by antiscion making a nice grand trine to the Moon and Venus, so that ties it in. Or am I thinking too wishfully here? Or is this as simple as the Moon - Venus trine indicating a gift (House 5. ruled by Venus) ? this makes sense only, I'm as confused as you are. Though, I must say that, though she intends to turn it into a home- if it still is a vehicle, I'd probably go for the 3rd (it is the description of the object and its main purpose I guess). But it's also a gift! They apparently come with bathrooms, kitchens, and living rooms - and you can drive them! Oh, yes, i've seen them too- and I do need one! So, back to the begining- it's a home on wheels. it could be both the 3rd and the 4th. I still think it is a vehicle but, then again- the ruler of the 4th (the home) is in Gemini and its cusp is in a cardinal sign so maybe it describes the desired object better. Only, the ruler of the 4th is cadent, in a late degree and separating from the Querent's ruler. The Moon is laso separating from both. Being placed inside the 2nd with the L1, it could be saying that she is actually wondering if her mother can actually afford to buy it. Yes, that's exactly what she's wondering. Her mother has an investment (the safe kind, as much as can be these days) maturing in January, and that's the money she's planning to use. If we go with the gift, though, it's definitely looking good with Moon/Venus ruling 5, Venus trining Moon in Venus's exaltation and Venus in Moon's rulership (and Jupiter, the 1 ruler dispositing the Moon), and the antiscion of Jupiter forming a grand trine to Venus and the Moon. Yes, I really want this to happen for my friend. If we go with the gift, though, it's definitely looking good with Moon/Venus ruling 5, Venus trining Moon in Venus's exaltation (and Jupiter, the 1 ruler dispositing the Moon), and the antiscion of Jupiter forming a grand trine to Venus and the Moon. It's true- when examined through the 5th, the situation does look a lot better. Moving vehicles (which I would consider a recreational vehicle to fall under) are 1st house. I always took the 5th as gifts in general, but the 8th is specifically gifts FROM others. 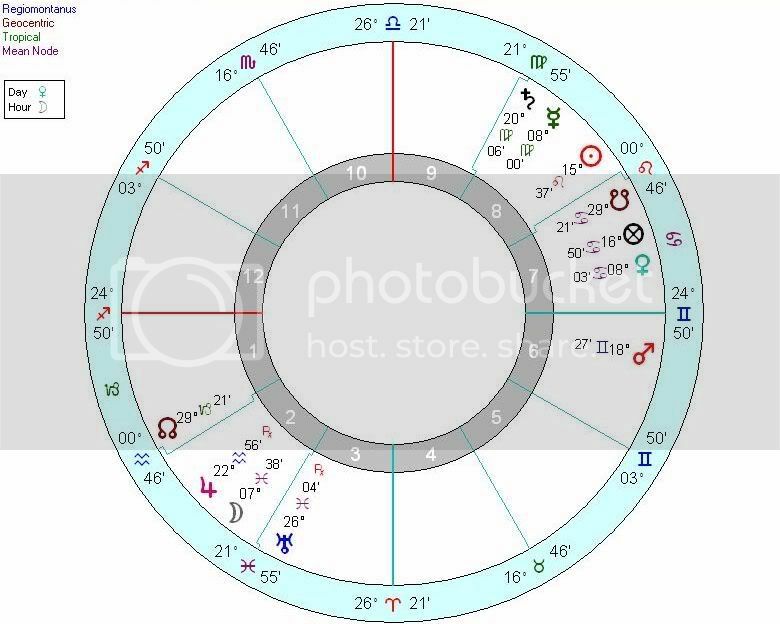 I have to agree that the Moon-Venus (Mom being Venus, the Moon being the question/co-sig for the querent) trine is saying something positive. There is mutual reception between the two. She at least means well. Also, the Moon/Jupiter are in the 2nd, which is the querent's moveable goods (the 2nd is also the mom's 5th - gifts). This is also Jupiter's traditional ruling house. The Part of Fortune is often assoc. with gifts, and it's conjunct the Mom in the 7th, in the Moon's dignity, and there's an applying trine from the Moon. The Mom being angular seems to bode well. After the Moon trine to Venus and the PoF, there is a square to Mars in the 6th and an opposition to Saturn in the 8th. I hope there isn't a complication, or possibly an accident that ruins the mobile home. Some say the end of the matter is a 4th house - and Mars IS the 4th house ruler. Moving vehicles (which I would consider a recreational vehicle to fall under) are 1st house. 1st? The first is the Querent! I always took the 5th as gifts in general, but the 8th is specifically gifts FROM others. Aglaya - per Lilly if you have a person or persons, and a place or thing represented by the same house, you'd use the planet ruling the house for the person or persons, and the house cusp itself for the thing or place. So if one took RVs to be 1, then the first house cusp would be the RV, and Jupiter would be the querent. I've opted to skip the 1/2/3/4 debate and simply put it as a gift - 5. I've heard the arguments for motor vehicles, moveable possessions, and homes, and I think gift both fits the best - and gets around that awful muddle! Are you sure this is written in Lilly's work? Could you give a reference because I'm not aware of where he says that. Hi, I believe he will get something, but maybe not a RV. There is signs of opposition and conflict, so this may show a change of mind. Who knows, maybe she give him a car instead, or something like that. If the Ascendant (house cusp) is unfortunate, the ship is wrecked. If the Lord of the Ascendant (the ruling planet) is fortunate, the people are saved. At least I take it to mean that if the Ascendant rules a person and a thing, then the person gets the planet, and the thing gets the house cusp. I have never done a gift question before, but the 8th is indicated as "gifts from others," and "moving vehicles" as 1st house in the book I most turn to (because of its accuracy): "Horary Astrology Plain & Simple," by Louis. They didn't exactly have recreation vehicles during Lilly's time. There are strong 8th house influences here, so this book may not be off. I have also seen in the Skyscript horary tutorial that there was mention of the 1st house being "the condition of vehicles." This may seem sort of odd, but BEFORE I ask a question, I have a clear idea in my head of how to assign significators. As the astrologer, you probably shouldn't wait for the chart to be made before you figure out where to look. I think astrologers tend to have different techniques anyway, and any can be accurate when done consistently. In my mind, the astrologer should have a true understanding of the nature question in general before they ask.